As talented as he is, Johnny Manziel’s style won’t appeal to the tastes of all NFL teams. This is the final part of an eight-part series previewing the NFL Draft on May 8-10. Today’s installment: Quarterbacks. The comparison is inescapable. The last quarterback who took college football by storm quite the way Johnny Manziel did the last two seasons was Doug Flutie. “He was like a combination of Fran Tarkenton and Doug Flutie,” NFL Network analyst Mike Mayock told reporters on a February conference call. Flutie, the 1984 Heisman Trophy winner and former Buffalo Bill, stood 5-foot-10, a tad shorter than Manziel, who measures 5-11¾. Both possess phenomenal instincts, pocket presence and play-making ability. Both are quick and elusive. Manziel is faster than Flutie. Flutie had a 19-year career in pro football and was adept at slipping tackles, hitting the ground and avoiding injury. There’s the biggest worry about Manziel. He does not have a compact, thick frame. Can he stay on the field in the NFL? Manziel is the most electrifying and arguably the top QB prospect in the draft, and he should be taken in the top eight picks. Also likely to be taken among the top eight is Central Florida’s Blake Bortles. The only other QB in the 2014 class considered a strong first-round prospect is Louisville’s Teddy Bridgewater. Manziel won the Heisman Trophy in 2012 after passing for 3,706 yards and 26 touchdowns and rushing for 1,410 yards and 21 TDs. His 2013 season was even better from a passing production standpoint. He threw for 4,114 yards and 37 TDs. He wisely cut down on his rushing, decreasing his attempts from 201 to 144 and finishing with 759 rushing yards and nine TDs. 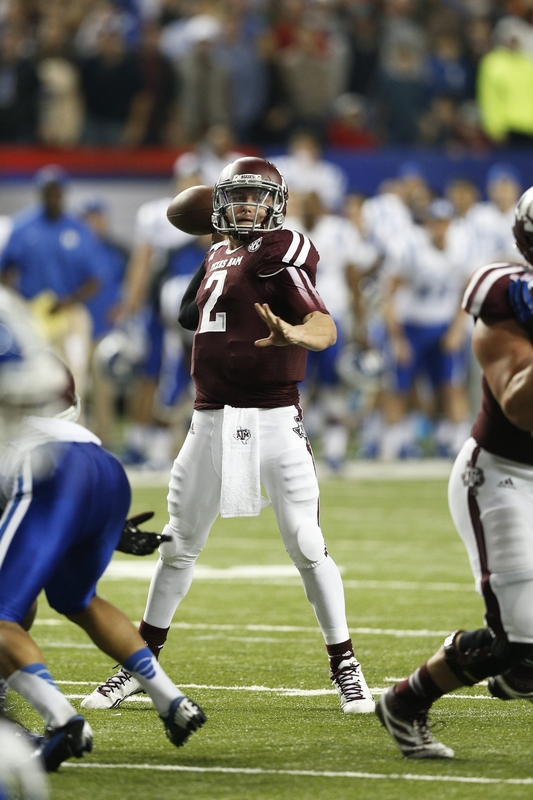 Manziel went 20-6 as a starter for the Aggies. The 6-5 Bortles has classic size and a stout body, and he moves and throws on the run well. He was lightly recruited out of an Orlando, Fla., high school. He was not high on fans’ draft radar after the 2012 season, when he passed for only 212 yards a game. But he threw for 275 yards last season in leading the Knights to a 12-1 record and a Fiesta Bowl win. He’s raw in his footwork. Bridgewater was viewed by draftniks during the season as a top-10 pick. But it appears numerous NFL scouts don’t have him rated quite so high. Bridgewater started as a true freshman and went 27-8 for Louisville. He’s a fine athlete with good character. He does not have a big frame, raising concerns about his durability, and he has small hands. His deep accuracy is suspect. He was inaccurate at his pro-day workout in March. Numerous big-time college quarterbacks who won a lot of games come with key question marks. Alabama’s A.J. McCarron is the best of that lot, but he is not an elite athlete. LSU’s Zach Mettenberger has classic size but poor mobility and is recovering from a knee injury. Georgia’s Aaron Murray is a winner, but he’s short. A lower-profile prospect who might turn out better than them because of his size and arm is Tom Savage, who bounced from Rutgers to Arizona before playing one season at Pittsburgh.